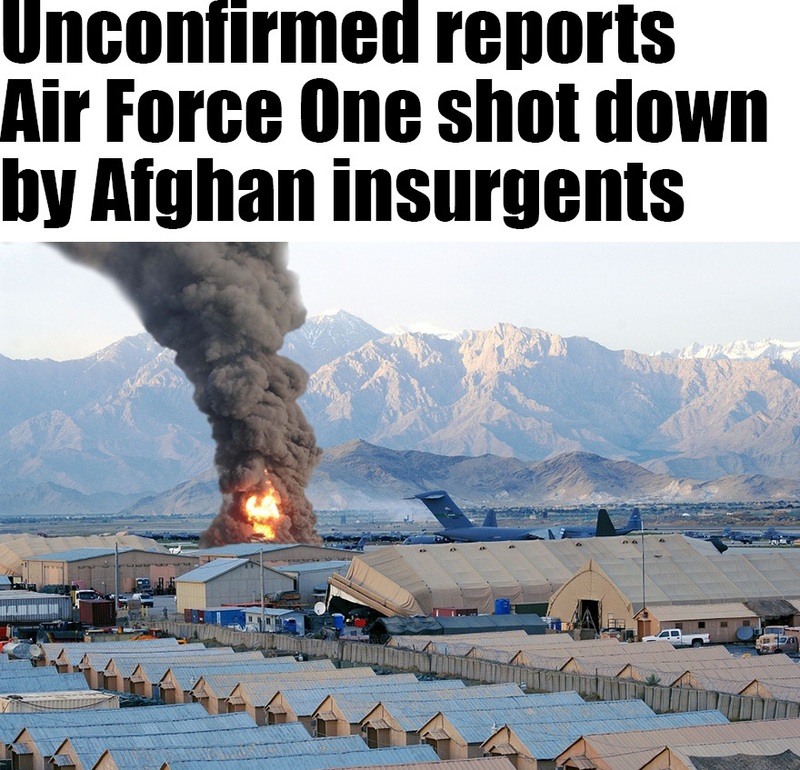 KABUL, Afghanistan — Unconfirmed reports from Bagram Airfield, Afghanistan, report Air Force One was shot down in the early morning local time, by Afghan insurgents hidden just outside the perimeter of the U.S. controlled base. It is uncertain if the U.S. President was on board at the time, however, many officials in the White House and Pentagon fear that he was, and may have died during the attack. Reports from U.S. Marine Corps Intelligence Activity (MCIA) operatives at Bagram suggest that insurgents armed with a surface-to-air missile were able to bypass all of Air Force One’s numerous electronic counter measures and downed the Boeing VC-25A during take-off. However, conflicting reports from the U.S. Army forces operating at Bagram Airfield suggest that Air Force One was not shot down, and is currently on route to Berlin, Germany, where the President will be attending a NATO convention. Meanwhile, emergency services, Army and Marine forces have mobilised to assess the wreckage to determine if the downed aircraft is Air Force One, and search for survivors. No group has yet claimed responsibility for what is being called an act of terrorism. Find out what really happened in the thriller novel The Benevolent Deception.